Begin your engagement photo session on East 4th Street, an idyllic representation of classic urban landscape. Lights strung laterally arch over the street lending perfect mood lighting to celebrate your engagement. This car-free, narrow brick laden street provides numerous photo opportunities. Cabaret and comedy bars line the street, reminiscent of times gone by. Pause at any of the outdoor seating areas to capture a pose of you and your fiancée surrounded by the historically crafted street and its urban appeal. After leaving East 4th Street, journey to the downtown main branch of the Cleveland Public Library. The gorgeous Louis Stokes Wing, completed in 1997, presents the architectural drama to match the significance of this moment in your lives. The Eastman Reading Garden adjoining the Stokes Wing adds to the grandeur of this stop along your photo session itinerary. Sculptures lend classical touches, while resplendent greenery maintains a steadfastly natural appeal. This location offers rich possibilities – beauty of architecture and richness of nature, both inherently impressive for your engagement photography. Your next destination will be The Cleveland Museum of Art, a classic photography choice for those in love. The exterior offers a myriad of pose options for the engaged couple, including a dramatic pool and fountain for a watery background. If your engagement photo session is scheduled for the winter, take advantage of the Museum’s Lantern Festival, a breath taking profusion of outdoor and indoor lanterns crafted by local Cleveland artists. Add in a touch of snow and the entire scene is fantastically unique for capturing the mystery and whimsy you share with your fiancée. Move next to the Museum’s interior which boasts spectacular architecture and class. The newly renovated Indoor Garden Court, with its barrel vaulted ceiling, offers the perfect light for highlighting the momentous nature of this step in your relationship. White oak floors and marble wainscoting walls lend intrigue and art to your engagement photos. Renaissance-inspired Armor Court provides yet another stage for your session as you progress through the Museum. After the art museum, take your fiancée and photographer to nearby Severance Hall, the home of The Cleveland Orchestra. Widely regarded by music enthusiasts as America’s most beautiful concert hall and one of the most impressive music halls in the world, Severance Hall claims membership with the National Register of Historic Places and is the recipient of the Honor Award by the National Trust for Historic Preservation. The lobby is an amazing display of art deco style, replete with gold inlay and a fabulous backdrop for the engaged couple. Your final stop for this phase of your engagement itinerary will be the Cleveland Botanical Garden. The recently opened Madagascar and Costa Rica gardens boast exotic, unusual plants and trees that offer other worldly ambiance for your photos. Air born wildlife adds a sense of the adventurous as your celebrate your movement toward an exciting life together. Picturesque bridges provide ideal photo opportunities for capturing the couple alone. The engagement photography possibilities of Cleveland abound. The downtown Public Square offers a perfect blend of old world and new. Pose with your fiancée beneath the towering backdrop of the Old Stone Church, evoking the timelessness of your love. The Soldiers and Sailors Monument contributes further historicity to your photos. For a truly classic local touch, pose with the Terminal Tower behind you. Rooting your engagement and story in Cleveland makes this stop a must. Another opportunity in Public Square is the Renaissance Hotel. The lobby and interior of this establishment provides beautiful staircases that act as natural stages for your photo session. Continue with your engagement photo itinerary by moving to the Westside Market, an indoor market in the old world style. Replete with hanging meats, cheeses, and breads, this vibrant cultural locale offers a very urban flair for your photo session. A balcony overlooking the market provides the ideal place to pose, while the aisles allow for a more bustling venue for a quick photo stop. For a distinctively Cleveland appeal, bring your photography session next to the classic Cleveland Arcade. The intrigue of this restored architectural landmark blends both fun and history for your photo backdrop. Beautiful, intricate balconies provide ideal vantage points for both serious and whimsical photos. This upscale, urban location is perfect for capturing the essence of who you are as a Cleveland couple. 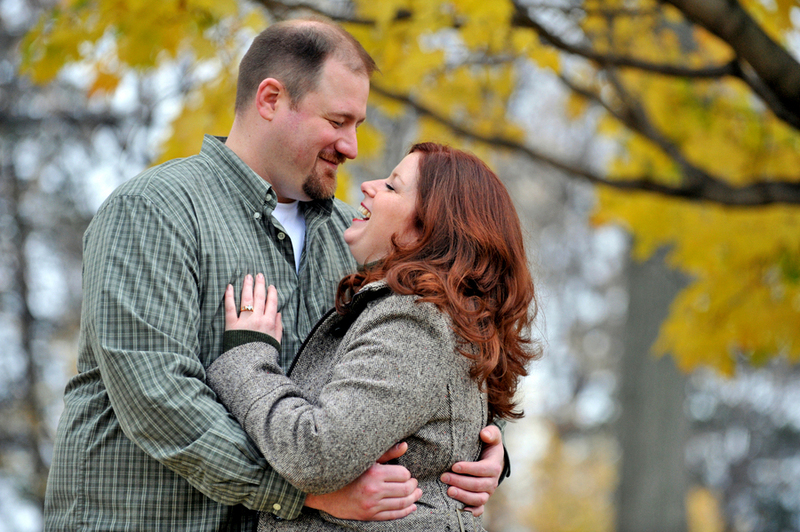 Close your engagement photography session with a visit to Rockefeller Park. Stunningly representative of the cultural and ethnic diversity that comprises Cleveland, this park encompasses many gardens of alternating altitudes and countless photo opportunities. In contrast to the more refined, constricted definitions often characteristic of planned gardens, the gardens of Rockefeller Park offer a more wild and naturally occurring feel. Sculpture drawn from diverse cultures and eras adorns the gardens and provides intriguing detail for your photos. Take advantage of this location to commemorate the personality and individuality that drew you to one another. Moving beyond the definition of Cleveland’s downtown area you will find photography gems for your engagement photo session. Let your imagination broaden as you focus on this moment in your life – select backgrounds that symbolizes the entrance to a new, shared stage in life. Just outside the city in Shaker Heights, still formally part of Cleveland, is Shaker Lakes. A peaceful, intimate place to discover nature informally, Shaker Lakes provides the perfect opportunity to capture formal poses amidst a beautiful lake and classic stone bridges. Make sure to bring your photographer to the smaller stone footbridge set back from the park’s main bridge. Use this to set the stage for serene poses of you and your fiancée. Follow your engagement photo session itinerary to the beguiling campus of Case Western Reserve University. The seemingly random assortment of architectural examples masks the isolated jackpots – be selective in choosing your backgrounds. Pause first at the Kelvin Smith Library for a few poses, and then move on to the campus’s Frank Gehry Building, an entirely unique structure and a priceless choice for distinctive engagement poses. Capture a few shots in front of the building, then move to the Wade Oval where the Art Museum and botanical gardens meet. From the Oval you will capture a better view of the Gehry building and optimize your photography potential. For the adventurous couple who desires the wild side of nature as their backdrop, head next to Cuyahoga Valley National Park, just a peaceful forty-five minute drive from downtown Cleveland. Stunning waterfalls and breath-taking rock formations offer truly unique vantage points to capture the drama of your new engagement. Intimate trails and deeply wooded coves provide ideal locales for several stops during your engagement photography session. The stark beauty of this natural setting lends a sense of pristine, powerful significance to the imagery of the photos that commemorate your decision to join your lives. Conclude this stop along your itinerary with a timeless shot of you and your fiancée surrounded by the colors of the setting sun. Views overlooking the dramatic valley offer priceless opportunities for gorgeous sunsets that match the beauty of your relationship.